DNR Proposing Deer Hunting Changes – ACTION REQUIRED! The Iowa Department of Natural Resources (DNR) is currently proposing sweeping reforms to the laws pertaining to deer hunting in Iowa. 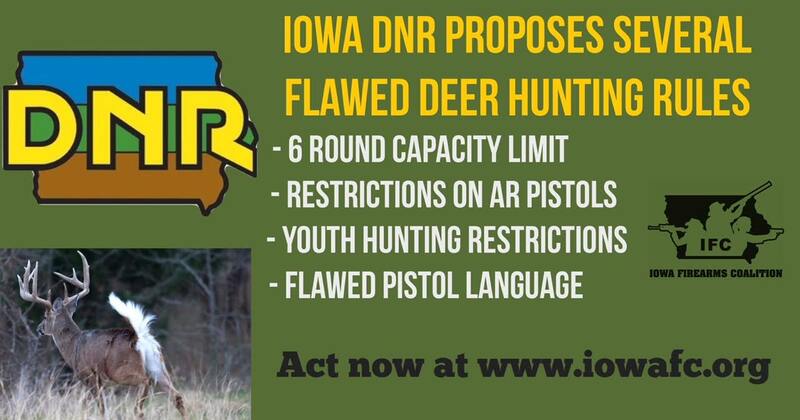 The Iowa Firearms Coalition is working hard to stop the DNR from implementing some terrible new restrictions on Iowa hunters and suggesting some changes that would be beneficial to Iowa hunters. The Iowa DNR quietly released a list of changes on April 24th that can be found on their website. The Iowa DNR is allowing the public to submit written comments on the proposals until 4:30 PM on May 1st. We have created an advocacy campaign on our website to share our concerns with the Iowa DNR. 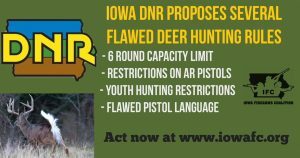 We are strongly urging you to participate and help us protect quality deer hunting in the state of Iowa. The DNR has presented baseless restrictions on AR format pistols that may be braced against the forearm or shoulder, when a hunter may legally use the same action type, caliber, and barrel length at the same time and place. The ATF has already established clear boundaries on the AR pistol, and the Iowa DNR appears to be trying to redefine the law or unreasonably extend its authority. 106.7(2)c3 contains a questionable restriction on pistols that are “designed to be shot with one hand” which could plausibly be a 1911 or a Glock? Does the DNR intend to take a position on whether or not hunters should use only a one-handed or a two-handed hold? We don’t see how DNR thinks they are facilitating a humane harvest when they are limiting my technique and reducing a hunters accuracy. This plan does nothing but make more coyote bait. Under current DNR rules, a youth hunter cannot harvest a deer with a pistol, even if they are in the pistol season and with an adult. DNR hunting policy has not been updated to be aligned with Iowa law. A 6 round capacity limit for all gun hunters has been proposed. The Iowa DNR does not have the authority nor the reasonable basis for imposing a 6 round capacity limit for shotguns, pistols, and rifles. This restriction should be removed entirely. IFC will be attending the public hearing on May 1st at the Wallace State Office Building in Des Moines (Conference Room 4E). You are also encouraged to attend if you wish to present your opinion. IFC Board Chairman Michael Ware will be discussing the DNR proposals and the need for action on the Simon Conway radio show today at 4:30 PM on WHO News Radio. The current proposals as written do not benefit Iowa hunters and go too far in diminishing the hunting experience that we value in Iowa. We will be going into greater detail at the public hearing on the changes we think are necessary to the current proposal. Share our concerns on our advocacy campaign with the Iowa DNR prior to the upcoming public hearing. Please share this with anyone else you know who is a deer hunter or Second Amendment supporter in Iowa. Let everyone know that the Iowa Firearms Coalition is working to protect the best interest of gun owners and hunters in the state of Iowa. Join us today on our website! The gun-control lobby has shined their spotlight on their chosen candidate in Iowa – Amber Gustafson, the leader of Michael Bloomberg’s Moms Demand Action in Iowa. Ms. Gustafson lives in the Ankeny area and is running for Iowa Senate, trying to unseat Majority Leader Jack Whitver. As the leader of the gun-control lobby in Iowa, you might think Amber would know a few things about Iowa’s gun laws, but we recently learned that in Amber’s case that’s just not true. It became obvious when Amber saw a headline that crime was rising in three Iowa cities and she took to Twitter to attempt to blame the gun lobby (i.e., IFC) for this trend. Apparently, Amber didn’t like being called out, which lead her went back to Twitter for long rant full of misrepresentations and showing her outright ignorance of Iowa’s firearms laws, specifically Chapter 724 of the state legal code where the majority of Iowa’s weapons laws reside. We’re sharing this because it’s indicative of what’s at stake, and what’s taking place right now. The gun control lobby in Iowa is trying to force their way into the Iowa legislature. This Twitter tirade is just one example of what lies ahead if we, collectively, fail to act. If we want to keep misguided gun grabbers from putting their leaders into positions of power we need you. The Iowa Firearms Coalition can lobby, we can provide you with alerts and emails, and we can work with legislators to pass pro-gun owner legislation, but the truth is our real power rests with you and the thousands of other Iowans like you who are reading this email. 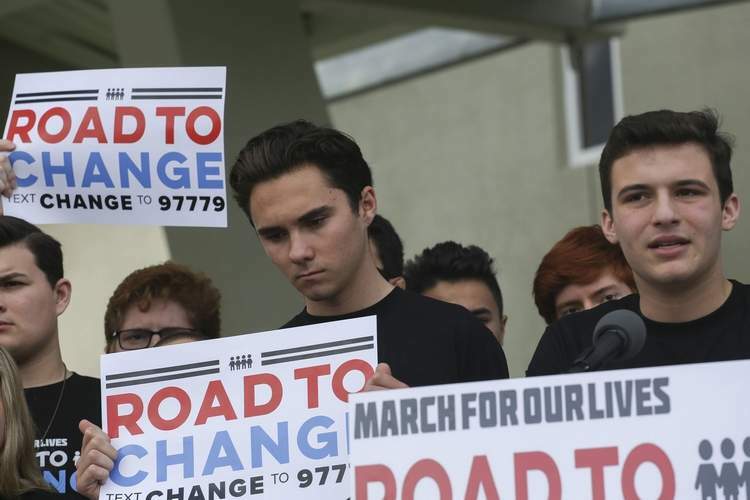 Right now gun-grabbers across the country are riding high, fueled by sympathetic media coverage. The gun control lobby is going all in on this election cycle with candidates like Amber Gustafson, and they’re already seeing returns on their increased pressure. States like Oregon and Illinois are adding even more anti-freedom laws to their books. Meanwhile, traditionally pro-Second Amendment states like Florida and Vermont, the home of Constitutional Carry, have added their new gun control laws. If you think we’re immune to this in Iowa, you’re wrong. The only way we keep this from coming to our state is to put our people in motion. That means you. That means working to make sure we keep pro-Second Amendment majorities Des Moines. We’ve got a plan in place, but what we need are people who are willing to work. People who truly value their freedom. People who recognize that defending the Second Amendment requires more than voting. There’s no shortage of things to be done and ways to help. The question is are you willing to step up and help shoulder the load? 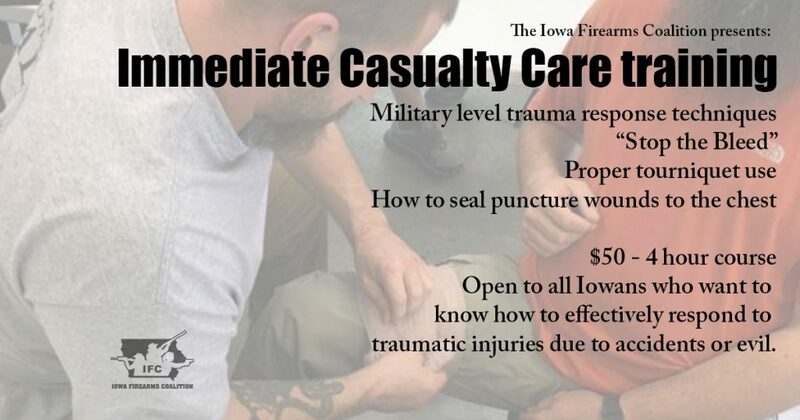 The Iowa Firearms Coalition (IFC) has organized two Immediate Casualty Care classes in Iowa. These courses will teach emergency response and patient management. Recent natural disasters and tragedies remind us of the need for individuals to be ready to respond and act in the event of an emergency. As such the IFC is leveraging its extensive network of industry professionals and first responders in order to further serve the people of Iowa. IFC’s Immediate Casualty Care course will teach participants skills that can save lives in the event of auto, farm, industrial accidents or other traumatic events. Students will receive Stop the Bleed training as well as Tactical Combat Casualty Care (TCCC) training that’s been developed specifically for U.S. military forces deployed around the world. From effective tourniquet use and how to stop life-threatening bleeding and learning how to seal puncture wounds to the chest. “This is not your summer camp first aid class. These are skills you wish you’ll never need to use, but if they are needed you’ll thank God you have them,” said Kurt Liske, President of the Iowa Firearms Coalition. The four-hour Immediate Casualty Care course will be offered on December 16th at Cedar Valley Outfitters in Marion and December 17th at CrossRoads Shooting Sports in Johnston. The courses will be strictly related to emergency medical care and are open to all Iowans, regardless of whether or not they own or carry a firearm. Participants will walk away with the knowledge needed to save lives. “The Iowa Firearms Coalition is doing real work that benefits the people of Iowa. We are putting tangible, life-saving skills into our communities. There’s no doubt in my mind that what we’re doing will save the lives of Iowans in years to come,” said Liske. The Iowa Firearms Coalition (IFC) is a grassroots Second Amendment advocacy group. Responsible for bringing uniformity to Iowa’s Permit to Carry process in 2010, legalizing suppressors in 2016 and passing the largest pro-Second Amendment bill in Iowa history in 2017. IFC’s members work to protect and enhance the Second Amendment rights of all Iowans. An affiliate of the National Rifle Association, the IFC actively seeks to foster and promote citizen’s right to keep and bear arms. Sign up for our email list for the latest on Second Amendment issues in Iowa. You can support our work by becoming a member or making a donation. Branstad expected to sign HF517 this week! We’ve cleared all the legislative hurdles. Passed all the subcommittees, committees and floor votes. Now the biggest pro-Second Amendment bill in the history of our state is one signature away from being law. Following an epic set of closing comments from Rep. Matt Windchitl the Iowa House of Representatives passed House File 517 for the final time, concurring with the Senate and sending HF517 to Governor Terry Branstad. Governor Branstad’s office has indicated he plans to sign the bill into law this week. Once the bill is signed by the governor two provisions, Permit Privacy and Supervised Youth Handgun Training, will be effective immediately. The rest, Stand Your Ground, SBRs/SBSs, Emergency Powers, and so on, will go into effect on July 1st. Representative Windschitl’s closing remarks on House File 517 have caused quite a stir throughout the state. 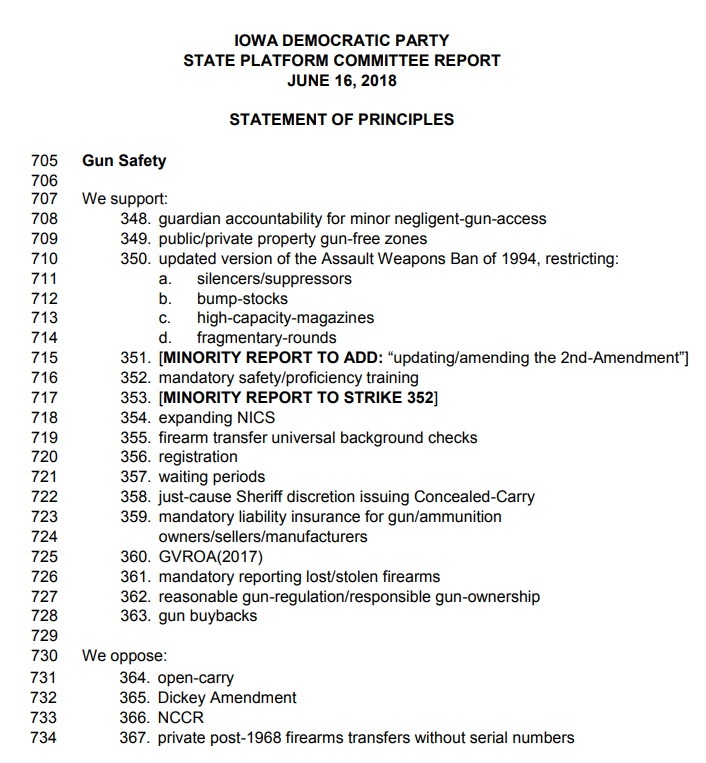 Windschitl called out the Iowa Gun Owners (IGO) group for lying to thousands of Iowans. Windschitl noted that despite their claims of being the driving force behind HF517, Iowa Gun Owners and their leaders never once spoke up about HF517, Stand Your Ground or any other provision of HF517 during the multiple subcommittees and public comment periods. IGO never registered as an organization in favor of the gun bill (here’s the list of everyone who actually declared for or against HF517) and most shockingly IGO isn’t even registered as a lobbying organization in the State of Iowa. We’ve uploaded Rep. Windschitl’s comments to our YouTube page.Windschitl’s epic closing comments caused enough stir that KCRG‘s Forrest Saunders did some digging and found even more concerning information on the Iowa Gun Owners organization.Tax documents from 2014 show Iowa Gun Owners made more than $293,000– mostly from grants and contributions. All but about $13,000 was spent. The majority of the money went to list email fees, direct mail fees and postage. There was no compensation listed for any employees, including Director Dorr, despite claiming he works 70 hours per week. To show how thankful we are for your continued support we’ve partnered with SilencerCo and Controlled Chaos Arms to give away a FREE SilencerCo Omega suppressor. If you’re an active IFC member you’re automatically entered to win. It doesn’t matter if you’re a life member, annual member, long-time member or brand new member. You don’t need to do anything, as long as you’re an active IFC member you’re automatically entered to win. If you’re not an IFC member, now would be a very good time to join. We’ll announce the winner Saturday, April 29th, so if you’re not a member yet you’ve still got a chance to join up and win. The Iowa Senate has officially passed the largest pro-gun bill in state history. House File 517, also known as the Omnibus Gun Bill, passed the Senate by a 33-17 margin on Tuesday, April 4th. The bill had an amendment, you can read it here, which means it’ll go back to the House for a concurance vote (which we expect it to pass easily) before going to Governor Branstad’s desk. The following Senators not only voted Yes on HF517, they also stood and testified in favor of the bill, often countering outrageous claims made by opponents of HF517. We encourage you to reach out to all the Senators who voted yes on HF517, but these seven most certainly deserve thanks. Also of note, HF517 passed with bi-partisan support. Republicans who have traditionally been strong supporters of Second Amendment rights were able pull four Democrats into the Yes column. This is significant and the Iowa Firearms Coalition commends these four for listening to the constituents and voting their district. Please take a moment to send them an email thanking them for their Yes vote on HF517. Remember, all session long legislators get bombarded with emails and phone calls from people demanding that they do this or that. Very rarely does a lawmaker ever hear the words Thank You, and when they do the remember it. It’s important that we acknowledge those who’ve helped protect and enhance our right to keep and bear arms. Please, take a few minutes to send a brief email thanking these Senators for their support. It doesn’t have to be anything in-depth. Just tell them you’re an Iowa Firearms Coalition supporter and you appreciate their Yes vote on HF517. You’d be surprised how few people take the time to thank those who do the right thing. Despite their best efforts our allies in the Iowa Senate were unable to bring HF517, the Omnibus Gun Bill, to the Senate floor for debate and a vote this week. The reason? Today (Friday) is the second funnel of the 2017 legislative session. Our bill cleared this procedural hurdle two weeks ago, but several other non-Second Amendment issues needed to get passed out of committee by today in order to remain viable. Also, according to Senator Brad Zaun, some key Senators who want to enthusiastically vote YES on HF517 had planned absences this week and wouldn’t be present if the bill was brought to the floor this week. So considering the full funnel week schedule and the schedules of their caucus, the decision was made to push the vote on HF517 back to Tuesday, April 4th. Senator Zaun assured us publicly at and a NRA/IFC Grassroots Action meeting that the bill will be run this coming Tuesday. You can watch video of Senator Zaun giving a crowd of more than 200 gun owners his word right HERE, his comments start at approximately 14 minutes. While the delay is frustrating, everything is still on track and we are still extremely optimistic we’ll be passing the biggest pro-Second Amendment bill in Iowa history. In fact we got some good news from Representative Matt Windschitl during Wednesday night’s NRA/IFC Grassroots Action meeting. Rep. Windschitl has been talking with the governor about our bill and the governor intends to sign HF517 into law when the bill is brought to him. You can see Rep. Windschitl’s comments on the video linked to above at the 35 minute mark. With these assurances we need you to help us make sure this all comes to fruition and the best way to do that is to get out and speak up about HF517 at this weekend’s legislative forums and coffee breaks. Here’s the list of each event taking place across the state this weekend. Please urge your Senator to pass HF517 and get this bill to Governor Branstad. We’re close folks, please help us push this through to the finish line! Late last week House File 517 passed out of the Senate’s Judiciary Committee on a 10-2 vote. The bill got bi-partisan support (the two voting against the bill were Senators Nate Boulton and Janet Peterson). Thank you to all you who contacted your Senator before last week’s Senate Judiciary vote.We’re now all queued up for a vote in the full Iowa Senate. Any day now the Senate could vote on the Omnibus Gun Bill. When they vote there are three potential outcomes: Pass HF517 as is, Pass HF517 with an amendment, or Vote down HF517. Read more about How a Bill becomes a Law in Iowa on our website. If the Senate passes the bill as is (without any amendments) the bill then goes to Governor Terry Branstad.If the Senate passes HF517 with an amendment the proposed changes go back to the House who will hav e to vote Yes or No to accept the Senate’s amendment(s). If the House accepts the changes the bill goes to the Governor’s desk. If they vote No the amendment is sent back to the Senate and they will likely create a joint “conference committee” of Senators and Representatives to reconcile their differences and find a compromise. If the Senate votes No on HF517 the bill is dead for the year. Needless to say we’re very close getting this bill to the Governor, but this is no time to get complacent! We need to you keep up the phone calls and emails to the Senate. Our Advocacy Campaign makes it ridiculously easy to email your Senator (it takes just seconds). Whether you use our Advocacy Campaign or write your own email to your Senator, please take some time to reach out in support of HF517. Your calls and emails really do make a difference. We saw that in the House and we saw it in the Senate Judiciary Committee where members of both parties supported our bill. Have You Bought A Membership Yet? We’re on the verge of passing the biggest pro-gun owner bill in the history of our state. If you’re reading this you’ve probably written an email or two, or made phone calls about gun bills in the past. We truly appreciate your support and we strongly encourage you to Become an IFC member. Your membership dues help us continue the work we’ve started, they help us build off previous victories and help us educate more Iowans who want to protect and enhance the Second Amendment in our great state. Annual IFC Memberships are $35 a year. We also have IFC Life Memberships available. We’re running a short-term special on life memberships. Our normal $600 life membership rate has been temporarily reduced to $400 if you sign up online and use the Coupon Code: LIFE. In the mean time, please keep calling, keep emailing and keep spreading the word about HF517. We’ll alert you as soon as we know there will be a Senate vote. In the mean time, THANK YOU for supporting the Iowa Firearms Coalition!